French article about the Ginkgo tree in 'La Nature' of 1894 by J. Poisson, a French botanist, 1833-1919. Read more on Gloubik Sciences. Ginkgo trees reflections in Buenos Aires, Argentina. Video on YouTube by Claudia Fogo. Ginkgo tree (c. 600 years old) and snow! at Shingu Kumano Shrine Nagatoko, Kitakata, Fukushima prefecture, Japan. * New Photo of the Month on photospecial page: Ginkgo leaf with raindrops. 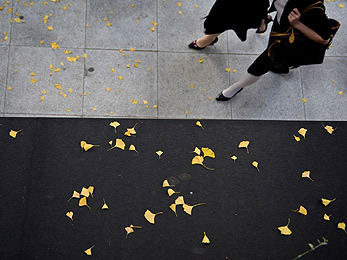 Fallen Ginkgo leaves on Garosu-Gil in Seoul. The name Garosu-gil is from the Korean word which means tree-lined streets, as the area is adorned with Ginkgo trees. Download wallpaper 1600 x 1200 pixels here. 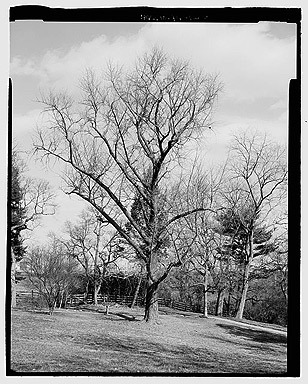 The oldest Ginkgo biloba tree in North America is documented at Bartram's Garden. Botanist William Hamilton introduced the Ginkgo there in 1785. Location: Bartram House and Garden, 54th Street & Lindbergh Boulevard, Philadelphia, Philadelphia County, PA. East side of the House looking east. Photo: website of the Library of Congress. Here you can download larger formats of this photo. 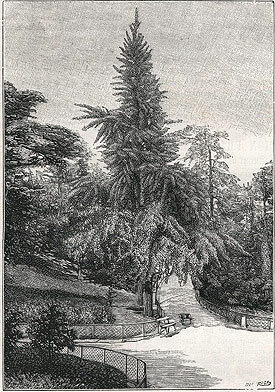 Read more about this remarkable tree on Bartram's Garden website. Read more about the Ginkgo's history on my website. 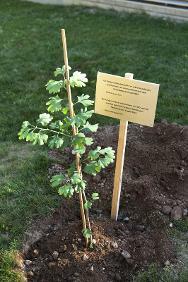 A descendant of a Ginkgo biloba tree that survived the atomic bombing of Hiroshima in 1945 was planted at a ceremony at the International Committee of the Red Cross headquarters in Geneva, Switzerland, today. This tree is the first sapling of the 200-year-old Hiroshima survivor tree to be planted in Switzerland. The seeds and saplings of a 200-year-old Ginkgo tree that survived the explosion have been nurtured and protected over the intervening decades and are now being planted worldwide. More A-bombed Ginkgo trees in Hiroshima on my website.